Bodhidharma was a Buddhist monk who lived during the 5th/6th century CE. He is traditionally credited as the transmitter of Ch'an (Sanskrit: Dhyāna, Japanese: Zen) to China, and regarded as the first Chinese patriarch. According to Chinese legend, he also began the physical training of the Shaolin monks that led to the creation of Shaolinquan. Little contemporary biographical information on Bodhidharma is extant, and subsequent accounts became layered with legend There are three principal sources for Bodhidharma's biography: Yáng Xuànzhī's (Yang Hsüan-chih) The Record of the Buddhist Monasteries of Luoyang (547), Tánlín's preface to the Two Entrances and Four Acts (6th century CE), and Dàoxuān's (Tao-hsuan) Further Biographies of Eminent Monks (7th century CE). These sources vary on their account of Bodhidharma being either "from Persia" (547 CE), "a Brahman monk from South India" (645 CE), "the third son of a Brahman king of South India" (ca. 715 CE).Some traditions specifically describe Bodhidharma to be the third son of a Pallava king from Kanchipuram. The accounts also differ on the date of his arrival, with one early account claiming that he arrived during the Liú Sòng Dynasty (420–479) and later accounts dating his arrival to the Liáng Dynasty (502–557). Bodhidharma was primarily active in the lands of the Northern Wèi Dynasty (386–534). Modern scholarship dates him to about the early 5th century. 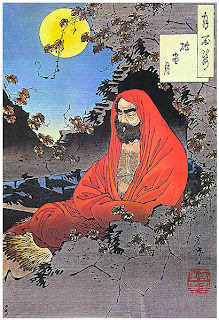 Several stories about Bodhidharma have become popular legends, which are still being used in the Ch'an and Zen-tradition. Bodhidharma's teachings and practice centered on meditation and the Lankavatara Sutra. The Anthology of the Patriarchal Hall (952) identifies Bodhidharma as the 28th Patriarch of Buddhism in an uninterrupted line that extends all the way back to the Buddha himself.